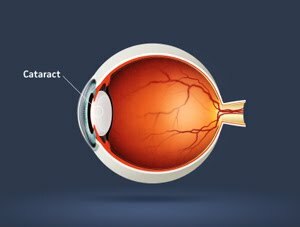 A Cataract is an eye disease in which the natural crystalline lens of the eye becomes opaque or cloudy obstructing the passage of light. Cataract progresses slowly causing vision loss and even blindness, if untreated. Loss of clear vision, Colors and shadows become less vivid, Nocturnal glare as if seeing through a veil and Halo around street lights are indicative of cataract. Studies have shown that Ultraviolet-protective sunglasses may help in slowing down or delaying the onset of cataract. On maturation of the cataract, surgical removal of the cloudy lens by making an incision into its capsule is the preferred choice. The removed natural lens is then replaced with a synthetic lens which restores the lens’s transparency and clarity of vision. Homeopathy is usually the first alternative available to a person when faced with the decision of undergoing the knife. Said that, most aren’t aware that Homeopathy can only be of use in the initial stages of cataract (early cataract), and is not recommended in its later stages when the cataract has matured. Though we have been offering a course or homeopathic medicines to individuals in the initial stages of cataract, we have no conclusive studies or means of evaluating whether the Homeopathic medicines have truly delayed the maturity of the cataract. In addition, since cataracts develop very slowly patients may fail to give us regular follow-ups making it further difficult to evaluate the true outcome of the treatment. We feel there is no harm in trying a short course of homeopathy in stages of early cataract as there are some very well indicated remedies which could help in slowing down its progression, evident from the cases treated at our centres. Matured cataracts cannot be treated with Homeopathy and it is better to have it surgically removed.